Pollen is in the air and dogs are everywhere! What a wonderful Week 2 we’re having with some great pups from the League for Animal Welfare. Speaking of pups, there is a new pup in the mix (all of three months old) as well as some pups you already know. Everyone is barking and playing and having a great time. 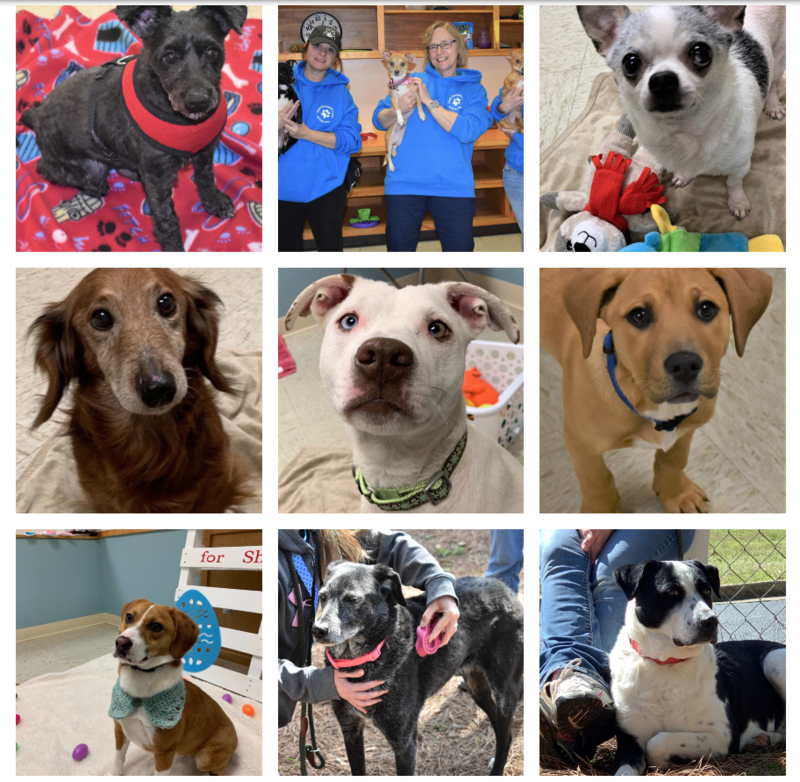 Cash – UPDATE – Cash was adopted 3/21/19! Sniffy UPDATE: This grand old dog will come when called, and is especially good with people when he meets them outside. He’s more shy inside. Rusty UPDATE: Little Rusty is still shy – he’s going to need a patient owner who can give him time and space to build his confidence. He seems more comfortable when his sister Angel is with him. Bae UPDATE: Bae is really making great progress during this visit to Encore! She’s been playing with several of the dogs and even the new puppy – they got along famously and she even let the puppy chase her around awhile! She accepts new people much better when there is another dog around. Mister UPDATE: Oops, we got Mister’s age wrong last week – turns out this cute weener dog is closer to 12 years old, not eight. So it’s really something seeing how he wants to trot around – he has a little hitch in his giddy up but he can still move about! Ethel UPDATE: Oops again, we got Ethel’s age wrong, too – this girl is only nine years old, not 13! She asked us to please let folks now she is still almost a spring chicken. She’s so easygoing. Mae UPDATE: Young Mae is all over toys – she’s great at fetch and retrieve. She’s so friendly and loves attention. Aspen UPDATE: Not just a pretty face – this young girl is gorgeous from head to toe. She loves sitting in people’s laps for attention and treats. She’s doing nicely on her leash walking. Krista UPDATE: this sweet shy beagle mix dropped by for a few days so she could keep making progress on her basic commands and remembering that people can be trusted. She loves playing with Bae! Tasha – Meet Tasha, the LAST of a litter of 10 puppies dropped off at the League earlier this year! She’s three months old, and so ready to go home since all her brothers and sisters left. She’s almost 20 lbs now and should be a good medium to large sized dog when full grown. We see yellow lab and some hound in her, with cute white markings on her chest and feet. She loves everybody and is learning commands so quickly – she already knows “sit.” She and Bae were quite the couple running in the play yard. All these dogs are available for adoption at the League for Animal Welfare.